We don’t make a huge to-do about Thanksgiving in our house. Since moving to California, it’s been a small, casual affair. I make up a few traditional side dishes/pies and M’s nephew comes over. Each year, I also create a new vegetarian main. It started with quiche and has since spanned from this Brussels sprout pasta through vegetable pot pies (coming later this week). This recipe is actually doable on a weeknight, no special occasion needed, but the cream sauce makes it feel a bit more indulgent. 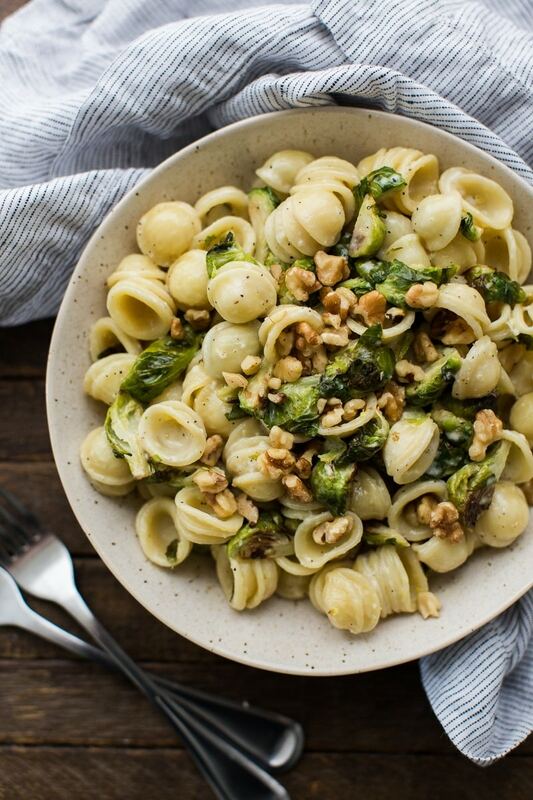 An easy pasta dish that highlights roasted Brussels sprouts, walnuts, and an easy cream sauce. Preheat oven to 400˚ F. Quarter Brussels sprouts and toss with 1 tablespoon olive oil. Spread into a single layer and roast until tender and browning, 20 to 25 minutes. While Brussels sprouts roast, cook pasta according to directions. Drain, reserving about 1/2 cup of pasta water and return pasta to the pot. To make cream sauce, heat olive oil over medium-low heat. Add garlic and cook for one minute. Measure in heavy cream and the 1 teaspoon of lemon zest. I eyed it, about 1/2 lemon. Bring the sauce to a boil and let cook until it thickens slightly, 6 to 8 minutes. Stir in lemon juice at the end. In the pot with the pasta, stir in the the sauce and the Brussels sprouts. Add enough pasta water for the sauce to coat the pasta/Brussels sprouts. 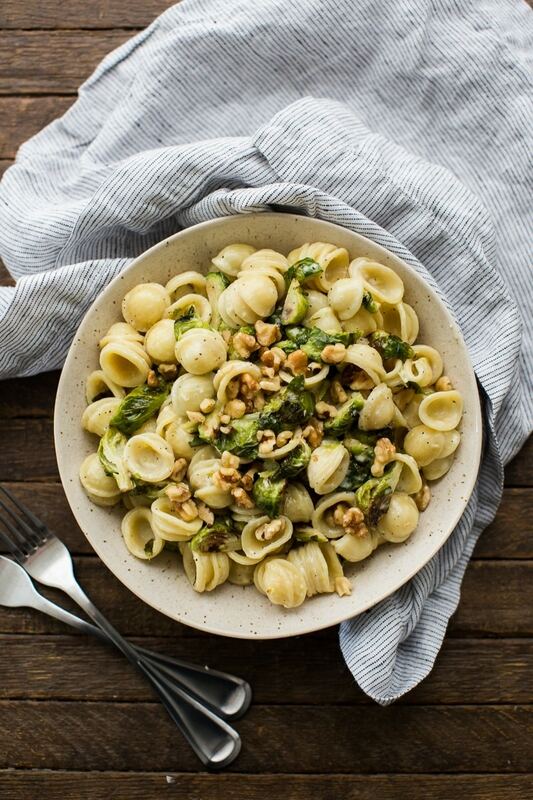 Transfer pasta to a bowl and top with toasted walnuts. Tips and Tricks: Make this recipe vegan by swapping out the cream sauce for this lemon-almond sauce. Link: Lemon Cream Sauce lightly adapted from Martha Stewart. Pasta: I love the pasta that is about the same size as the Brussels sprout quarters but you could easily do long noodles and/or make your own pasta. Cream: While I love this cream sauce, a 1/2 cup of cream is heavy. 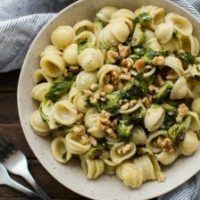 If you’re looking for an alternative, easy sauce, I love this goat cheese sauce from this pasta dish. Vegetables: Another of my favorite versions of this pasta doesn’t require even turning the oven on. I like to add greens to the end of the pasta cooking to soften, then toss everything with the lemon cream sauce. Chard, kale, or spinach works well (although with spinach, I add to the pasta after draining- it doesn’t need much heat). Brussels Sprouts are a fall treat, especially when cooking and buying them at their freshest. 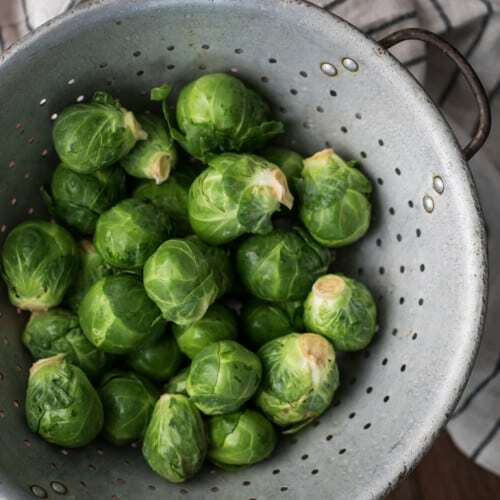 When at the market, look for Brussels sprouts still on the stalk, these are often fresher than their loose counterpart. Brussels sprouts and walnuts and pasta- three things that I absolutely love, combined into one happy dish. My Thanksgiving’s running pretty traditional, but I would love to make this for a weeknight dinner. Oh my, this looks utterly delicious and so comforting. Thanks for sharing, Erin! I cannot get enough brussels sprouts. I honestly find them more necessary at Thanksgiving than the turkey itself. Love the combination with pasta! I love the addition of the step-by-step photo directions to your posts! This dish is right up my alley! I’m making it tonight! Do you normally quarter your brussels sprouts? I usually halve them, but more crispy leaves sound good to me. I go back and forth but I like the quarters in pasta (the pieces are a little more even to the pasta). 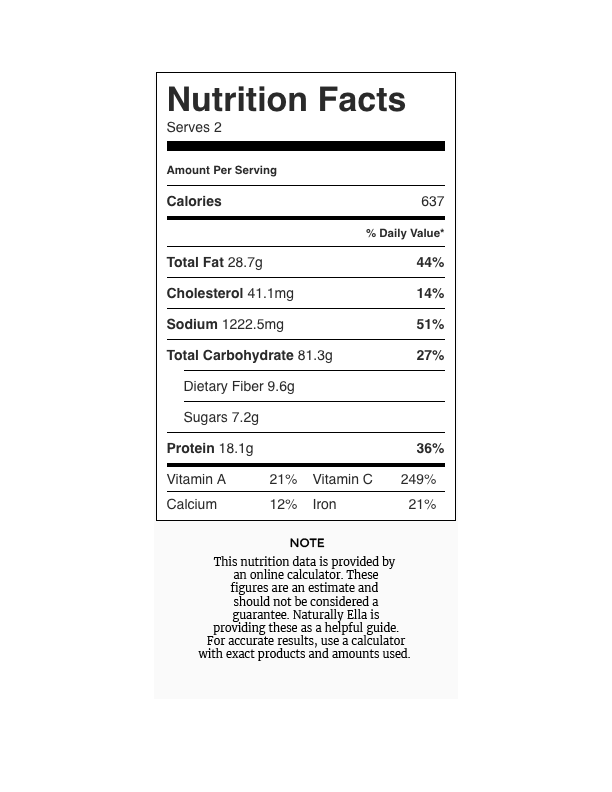 Do you have a less caloric substitute for the heavy cream than goat cheese? I’m sorry, I don’t. This is one of those recipes that’s probably better skipped if wanting to keep it low calorie. The cream really makes the dish. I adore your mind to come up with new simple combinations that are just so appealing! Orecchiete pasta is so perfect for this one! I’m not usually one for brussel sprouts but this looks good! Yum! I’m making this right now and wondering when to put the lemon juice in. YUm!! Fixed- and at the end of the sauce cooking. This pasta looks so tasty! Do you think it would taste the same without the lemon zest? Honestly, the lemon is a big part of the flavor profile so while I think it would still taste good, it definitely wouldn’t taste the same! This was the first recipe I tried here at Naturally Ella and it is now a staple in our house! The only change we make is no walnuts, and it is still delicious! Made this tonight, tasted amazing! Restaurant quality and I am a cooking novice. Usually I can’t get sauces to turn out well, but this one was perfect. I LOVE brussells sprouts. They don’t get enough praise! I want to try this so bad now! 🙂 Looks delicious! This looks fantastic. I am trying to eat vegan more often. Do you think it’s possible to use coconut cream instead of cow milk cream? I think so- I’ve not tried it but I don’t see why it wouldn’t! Made this tonight and it was outstanding. I used chickpea pasta shells and it was perfect plus with added protein and fiber! I also had shredded brussel sprouts on hand and they worked perfectly! I made this for lunch today. I was out of cream and I live in the middle of nowhere, so I substituted plain yogurt and mayo, this was an excellent dish. Thanks for the recipe.